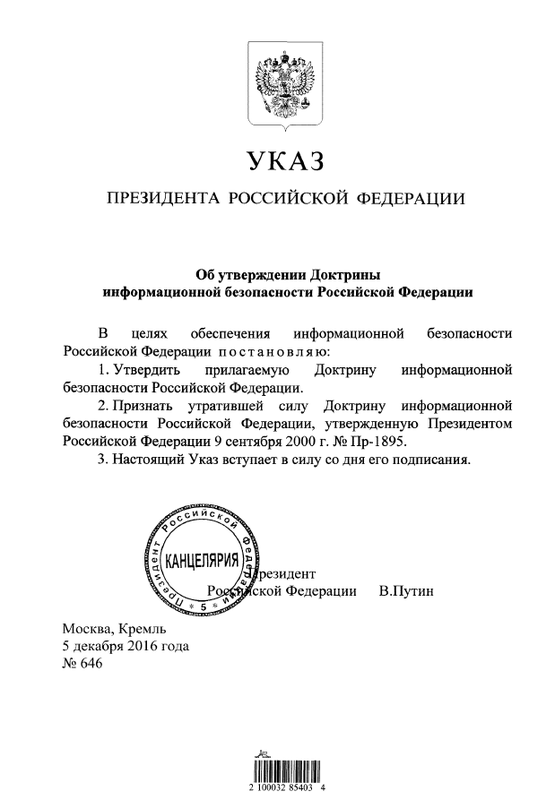 The following is the official information security doctrine of the Russian Federation signed by Vladimir Putin in December 2016. A complete English translation is provided below. This doctrine supersedes a previous version signed by Putin in September 2000. The Doctrine defines the information sphere as a combination of information, informatization objects, information systems and websites within the information and telecommunications network of the Internet (hereinafter referred to as the “Internet”), communications networks, information technologies, entities involved in generating and processing information, developing and using the above technologies, and ensuring information security, as well as a set of mechanisms regulating public relations in the sphere. h) the information infrastructure of the Russian Federation (hereinafter referred to as the “information infrastructure”) is a combination of informatization objects, information systems, Internet websites and communication networks located in the territory of the Russian Federation, as well as in the territories under the jurisdiction of the Russian Federation or used under international treaties signed by the Russian Federation. j) neutralizing the information impact intended to erode Russia’s traditional moral and spiritual values.